A famous prehistoric cave above the bank of the Natuf valley. It gave the name of an Early Man culture. A famous prehistoric cave above the bank of the Natuf valley. The archaeological findings in this cave (1928) were the base of a new Early Man prototype culture - the Natufian culture (12,500-9,500 BC). These ancestors lived in a permanent place before the introduction of agriculture. 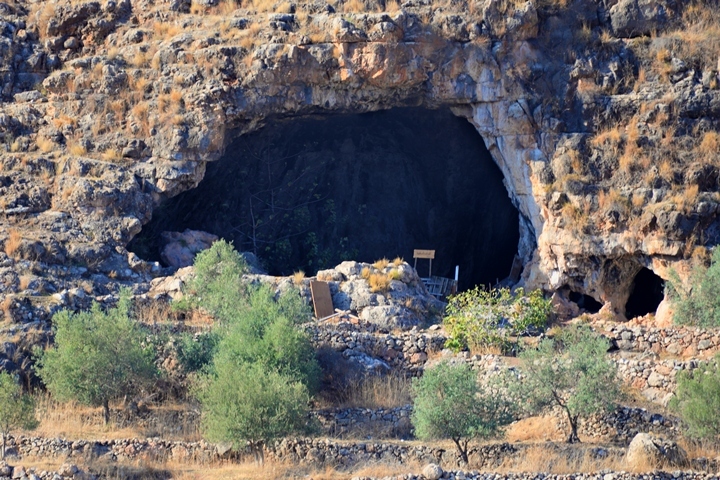 The cave is located on the north bank of Wadi en-Natuf in the western Samaria area. Its height is 258m above sea level, 50m above the stream. The Natuf stream flows westwards, from the Gofna mountain area, passing north of Tel Hadid, then connects to the Ayalon river near Lod. 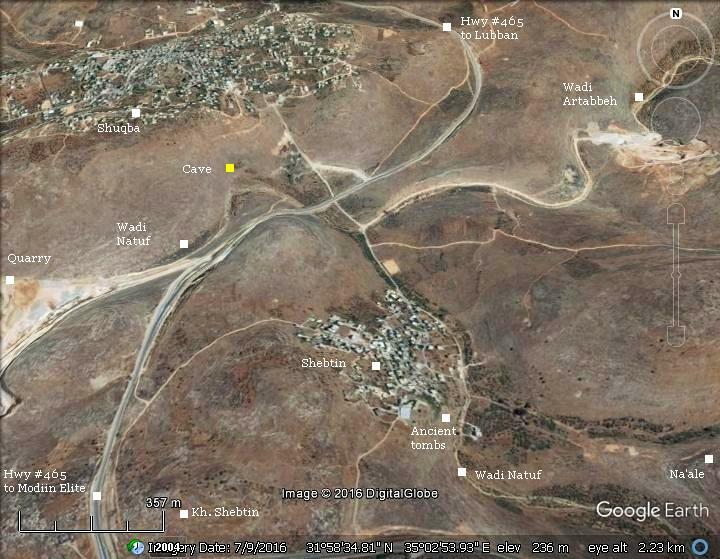 The cave is located in area C - under full Israeli civil and military control. It is marked by a yellow square in the map. The Natufian culture, first identified in the Natuf valley cave, lived between 12,500-9,500 BC, in a prehistoric period called Late Stone Age (Epipaleolithic period, 20,000-10,500 years ago). These were the times of transition from the caves to permanent settlements outside the cave and the beginning of agriculture. They lived mostly outside the cave in round huts, and were hunters-gatherers. The Natufian settlements preceded the Neolithic ("New stone age") settlements (8,300-4,500 BC), who farmed and raised animals. The Natuf culture differed from the other Epipaleolithic cultures in their tools, the location and size of their sites, in the type of housings, their social structure, and their burial practices. Tools: The culture used microlithic stone tools for their hunting tools, which was previously unknown to the excavators. These tools are about 1cm long and 1/2 cm wide, and used in spears and arrowheads. The tools, made of flint and bones, included "lunates" (tools that have a blunt straight edge, and a sharpened crescent shaped back) and sickle-blades. The Natufians made tools of stone (either limestone or Basalt) or animal bones, but they did not have pottery. They traded with sea shells and jewelry made of animal bones. 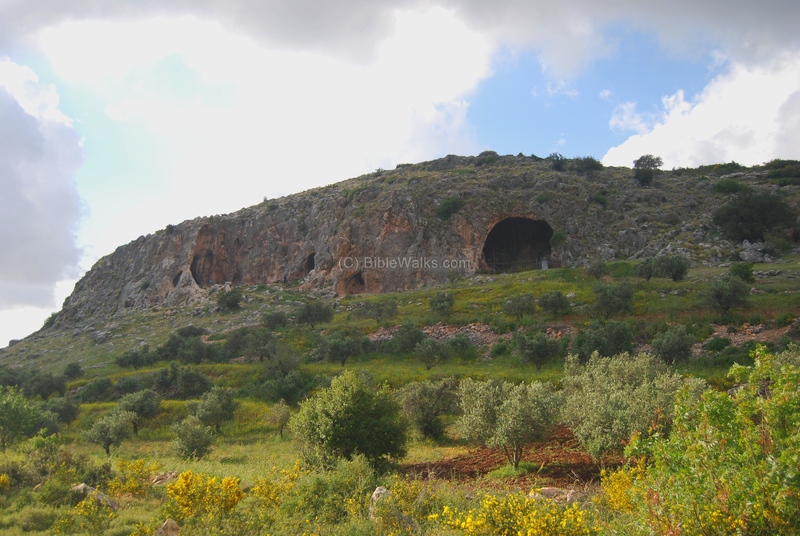 Locations: Natufian settlements were found in other caves in the Levant. 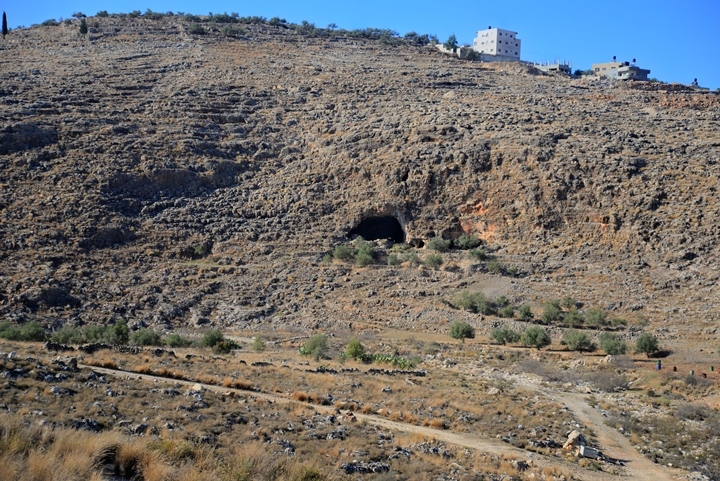 During the early phase of the culture they occupied caves north of Beersheba and south of the Lebanon mountains. In the late phase, the Natufian population expanded to the south Negev area (Mt. Harif) and to northern Syria. Housings: During the period of the Natufian culture these hunter-gatherers built a village on the area in front of the cave. Each such village consisted of several families, with 80-160 persons in the larger sites. A display of a Natufian village is seen in the Carmel caves park. A group of cavemen is seen in front of the Nahal cave. The display shows how they used these makeshift housings for hunting and fruit gathering, and important step for civilization of mankind on its way out from the caves. 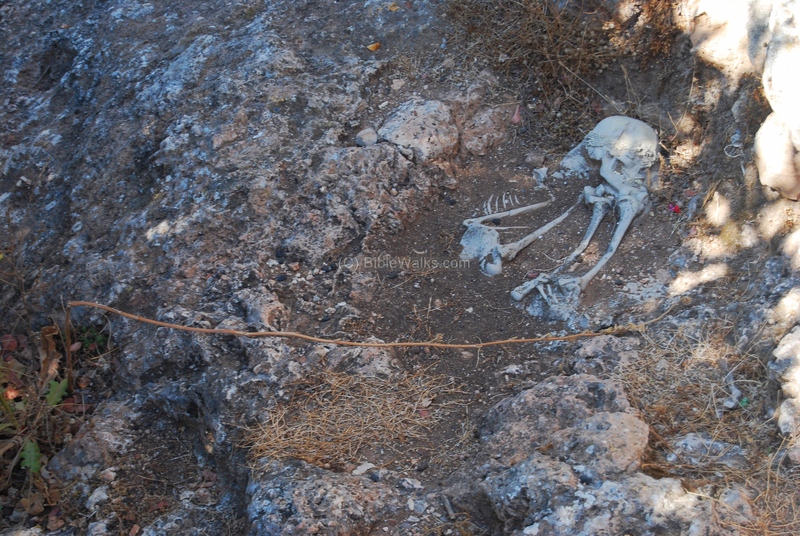 Burial practices: A copy of a decorated skeleton, belonging to the Natufian burial site, is located at this site on the terrace on front of the Nahal cave in the Carmel caves site. The skull is decorated by small bones - a common Natufian burial practice. A wall was built as part of the cemetery, an important phase of human construction. A map of the area around the cave is seen here. 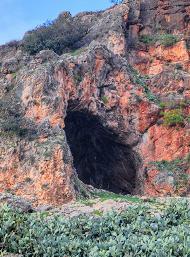 It is marked as "cave" under the Shukbah village. "Shukba - A small village on high ground, surrounded with trees". "Shebtin - A small village in a valley, with a well to the east. It appears to be an ancient site, and has rock-cut tombs south of it". "Khirbet Shebtin - Traces of ruins". "Khirbet Hanuneh - Traces of ruins and fig-gardens". The cave was first discovered scientifically by father Alexis Mallon in 1924. An archaeological excavation took place in 1928 for one season, headed by Dorothy Garrod. The team identified an unrecognized prehistoric culture, with a new set of stone tools in the deposit of this layer. The same type of deposit was also found in her other excavations in the Carmel caves. She named it the "Natufian" culture after the cave that it was first found. This new culture was also joined by the French archaeologist René Neuville in 1931. Neuville excavated the Judean caves and Qafzeh cave. Dorothy Garrod was a British archaeologist, and one of the pioneers of the prehistoric cave researches. At her times, the prehistoric research in the Levant was in its infancy stage. The Natuf valley cave was her first in the Levant. She later (1929-1934) excavated the Carmel caves and the Kebara cave on the western foothills of the Carmel near Zichron Yaakov. In her excavations she employed women workers from the local villages, a novelty at those times. 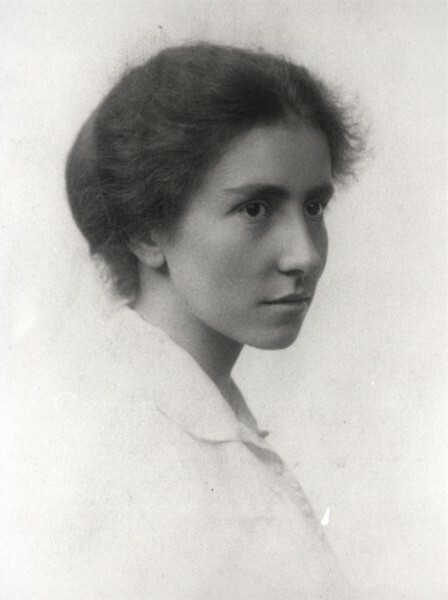 Dorothy (1892-1968) is also credited for being the first female professor in Cambridge (1939). Brian Boyd (Univ. of Wales) and Zoe Crossland (Univ. of Michigan) continued an excavation in 2000. Both now (2017) are in the University of Columbia. Brian is currently (2017) working in the site with Dr. Hamed Salem (Birzeit University) with collaboration from the Shuqba Town Council. The cave and Wadi Natuf are on the tentative list of UNESCO World heritage sites. The justification for the heritage status application is (as per UNESCO page): "Shuqba cave is the type-site of the Natufian culture now recognized worldwide. It marks a critical point in the evolution of human culture in south west Asia, when people were practicing the old hunter-gatherer economy but now from a settled base on a communal basis, before, perhaps immediately before, it evolved into an agricultural phase with selectively domesticated flora and fauna.". 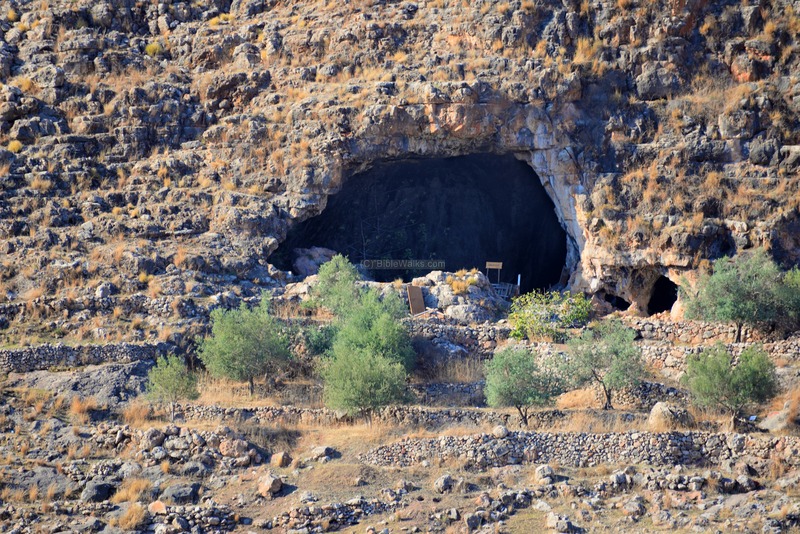 The cave is located on the foothills below the Shuqba village, 22m above the valley bed. The Natuf valley is at the bottom of this view. The name of the Natuf stream can be translated to the "dripping" stream in both Arabic and Hebrew. Its name was derived from the year round stream of water, as dozens of springs on the foothills of the Gofna mountains supplied plenty of water during the ancient times. The prehistoric men enjoyed the safety of the cave, the year round stream of water, and the game they hunted in the Natuf valley area. Shuqba means in Arabic: wide open crack, so the village above the hill is named after its big cave. The cave is named the " Shuqba cave", or also the "Natuf cave". It is a Karstic cave - formed from the dissolution of the limestone rock. Limestone dissolves with rain charged with organic acid. Initially the process starts with the cracks, then they expand into a larger cavity. The Shuqba cave is one of the largest in the region. It opens up to a central chamber, 18m in diameter and 22m high. There are three chambers in the rear. The roof has two large dissolution chimneys, and dissolution sinkholes in the floor of the cave. The archaeologists found two major prehistoric layers of occupation, in addition to a layer ('A') of more recent periods (Bronze age to Byzantine period). The oldest layer ('D') was of the Middle Paleolithic Mousterian period (150,000 - 40,000 years ago), while the later layer ('B') was from the Late Natufian period (10,800–9,500 BC). A stone quarry is located just 1200m from the cave. 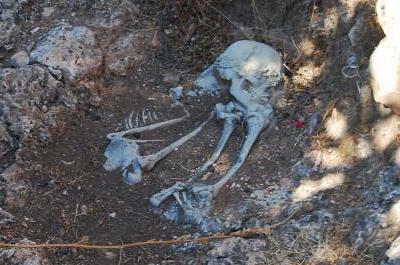 Interesting, the Early Man also quarried here and prepared stone tools... The majority of the prehistoric stone tools were found around the cave area, but another area with chipped stones was found on a terrace 200m south of the cave. The large set of caves is located at the western slopes of Mount Carmel, in Nahal Maarot. 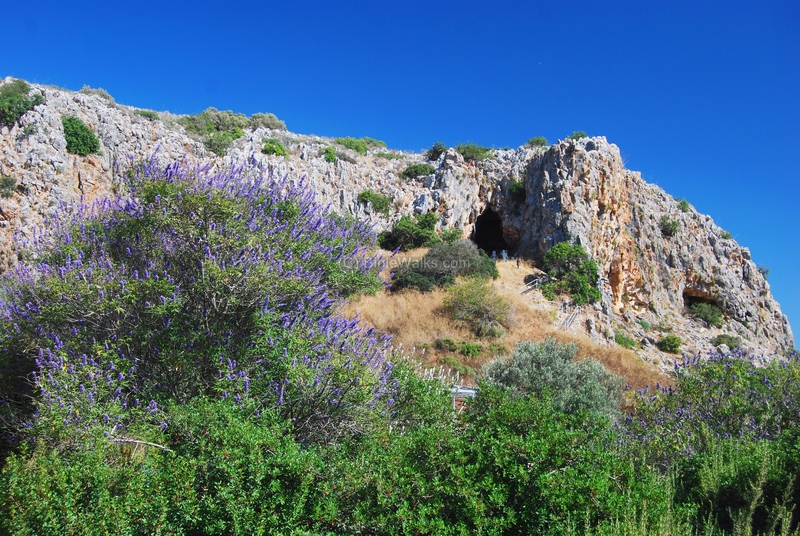 The Nahal cave was inhabited at several periods, with period 3 was the Natufian period. The site is located at the western edge of the Oren valley. 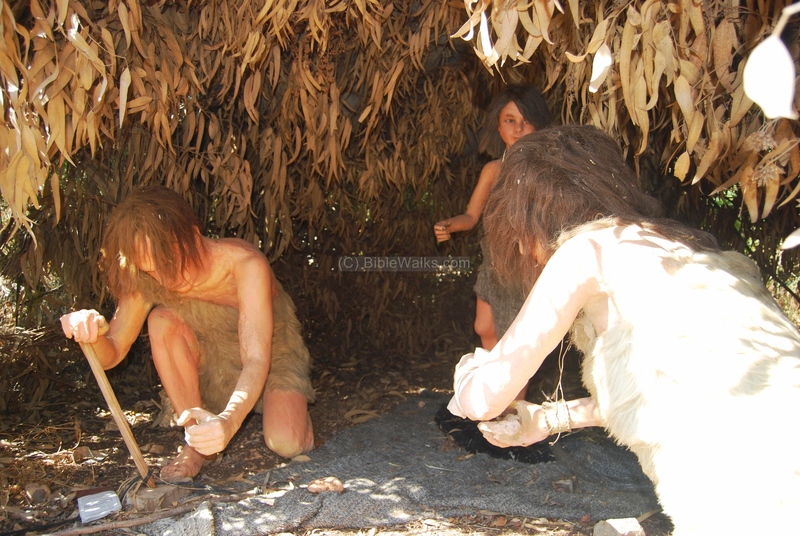 In the hills there are a series of prehistoric caves, and one of the identified periods was Natufian. 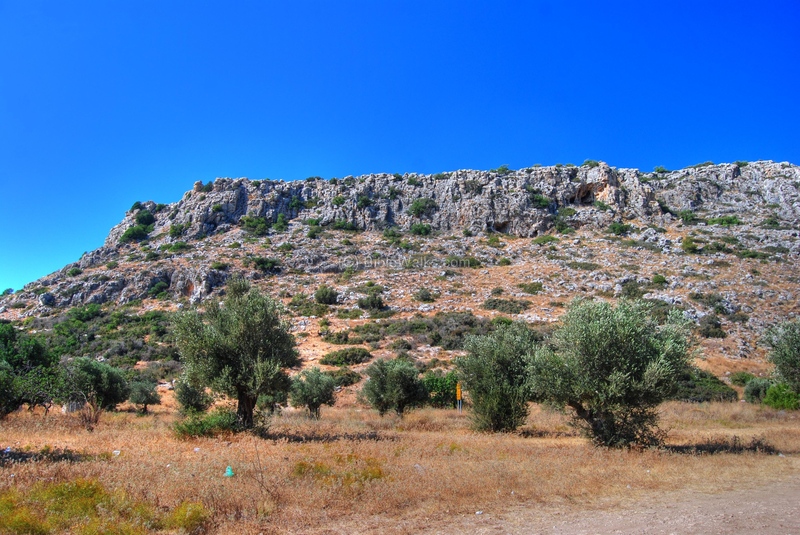 A nature reserve on the western edge of Beit-Hakerem valley, with a cluster of caves with remains from prehistoric settlements, including the Natufian. 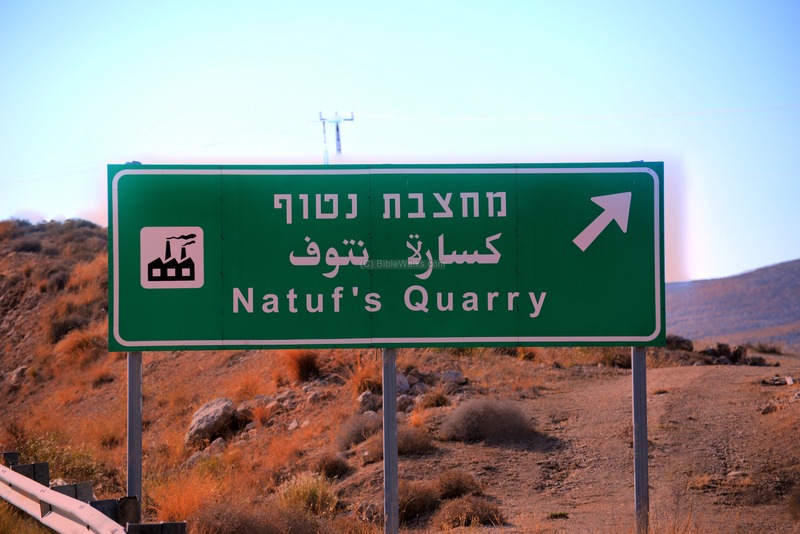 Natuf, Natouf- the name of the stream and valley; Natuf is "valley of drippings" in Arabic, and similar to Hebrew root of N-T-F (drip). Shuqba, Shuqbah, Shukbah - The village near the cave, and the name of the cave. Arabic: deep open crack, opening, or narrow pass. (as per PEF dictionary). Shuqba cave - the deep opening cave. Shebtin - nearby village and ruins; a private name (as per PEF dictionary). .